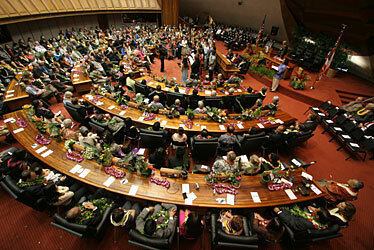 The Hawaiian Chorus sang yesterday at the state capitol during opening ceremonies of the Legislature. Seizing on a theme of Hawaii-born presidential hopeful Barack Obama -- the need for change -- House Speaker Calvin Say urged his colleagues in the state Legislature to buck the status quo and embrace change for the good of all Hawaii. "I believe in my heart and with my whole being we can make Hawaii a better place," Say said. "To do that we must embrace change not as a political slogan, but as a way of life." Say's message echoed throughout the halls of the state Capitol as the Legislature opened the 2008 session. His call for changing the status quo rang especially loud in the ears of Gov. Linda Lingle, who called yesterday's opening day the most promising of the six she has been to since being elected. "I would say this is the most exciting of the six, the most optimistic and the most in alignment between the two houses of the Legislature, between the two political parties and between the two branches of government," Lingle said. "I see great potential in this session to address the key issues of energy, of what kind of future do we want to have and the role that education is going to play. "This could be the most productive session that I've seen." Lingle gets to lay out her priorities to lawmakers and the public Tuesday, when she delivers her State of the State address. While she has not provided specifics, she has hinted that it will include "targeted" tax cuts and a continued focus on innovation and high-tech sectors of the state. "I think you're going to see a lot of alignment with what you heard in both houses and from both political parties," Lingle said of her address. "I'm the only one who knows right now what's in my speech. There is alignment, and I think it really is a great sign for Hawaii's future." Both Say and his counterpart, Senate President Colleen Hanabusa, seized on "sustainability" as the buzzword for a stable environment. "To take charge of our own destiny, we must recognize that good environmental policy and a sound economy should work together," said Say (D, St. Louis Heights-Wilhelmina Rise-Palolo Valley). Hanabusa (D, Nanakuli-Makua) trumpeted the Legislature's 2050 Sustainability Commission, also saying, "If we cannot make Hawaii a place where our best and brightest can build a rewarding future, then we will have failed. ... We will not fail." One of the strongest pro-environment stances came from Senate Minority Leader Fred Hemmings (R, Lanikai-Waimanalo), who called for limiting the number of tourists coming to the islands. He also urged colleagues to consider ways of making the need for fossil fuel obsolete within the next decade. Also attending opening day festivities were members of the University of Hawaii football, women's soccer and women's volleyball teams. The teams, all of which won Western Athletic Conference championships, were honored by the Legislature. With the recognition ceremony as a backdrop, lawmakers pledged their support for the university. Aging and dilapidated facilities throughout the 10-campus system have been in the spotlight recently, largely due to last week's departure of football coach June Jones, who had long complained about the poor state of the athletic facilities. "Regardless of the tough budget problems we face this year, we must find the money to help the university deal with this crisis," Say said, drawing perhaps the loudest ovation during his speech. "I promise you, on behalf of the 51 members of this chamber, we will do our share." Star-Bulletin reporter Richard Borreca contributed to this report. » Celebration honors Martin Luther King Jr.